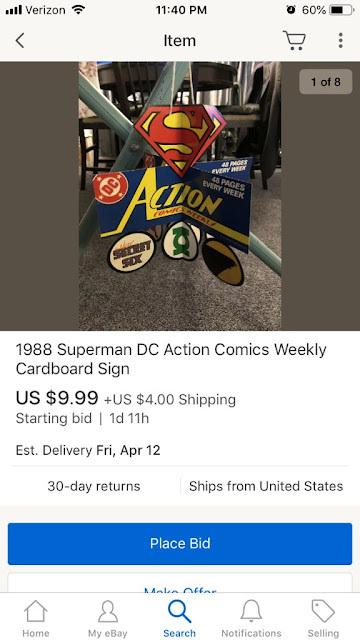 While it looks like something you'd probably attach to a child's crib, it's actually an old retail sign for... the very series we've been discussing for the past several months. Man, how cool is that? I tell ya what, if I wasn't an eBay-fearing Luddite, I'd be all over that thing! First (and only) time I ever eBayed... I got ripped off. You know what they say: Once bitten, twice stubborn... er, shy. Thanks to this "mobile", I was able to construct our "New" Secret Six button that we'll be seeing more of around here in the weeks to come. Big thanks to Jody for sharing this... it's definitely a cool piece of DC Comics ephemera! We pick up right where we left off. 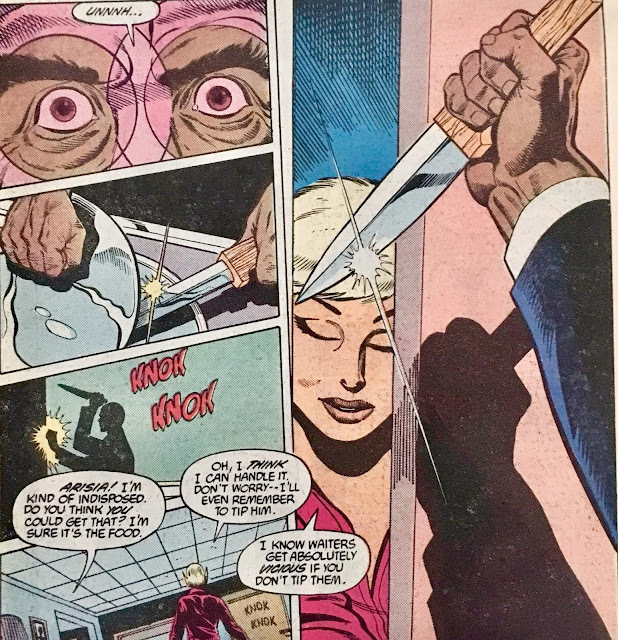 The Mad Samurai Guy is slicing civilians willy-nilly, and Hal just tossed his ring in order to face him mano y mano. He rushes in, and socks the baddie with a solid right punch to the gut... which winds up aggravating a wound he had on his right bicep. I... uh... don't remember when he hurt himself, but we'll keep it going. 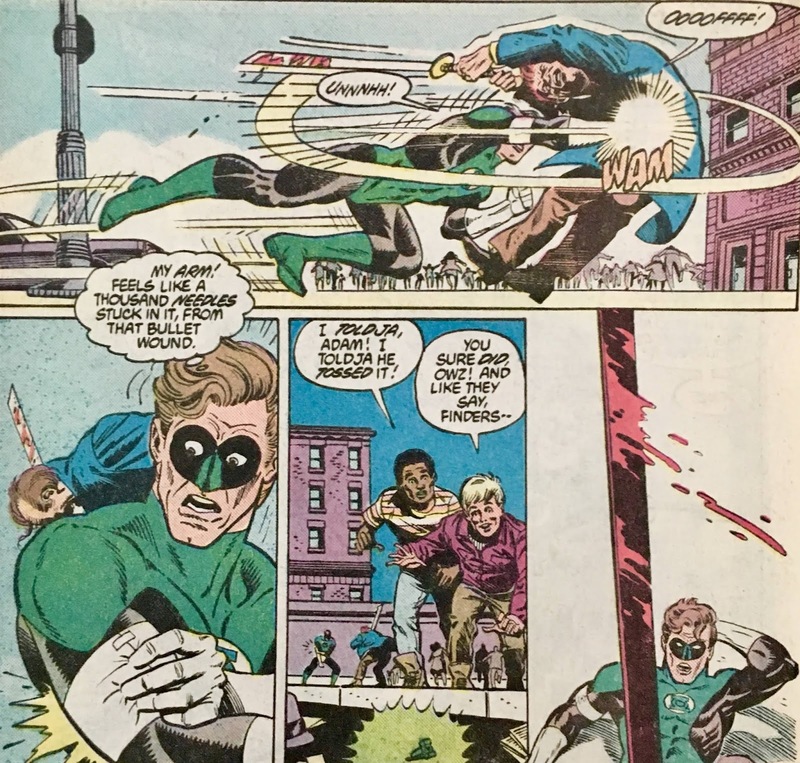 The Mad Samurai Guy regains the offense, and is just about to strike down upon Green Lantern, when Hal gives him the ol' kick to the family jewels to put him out! 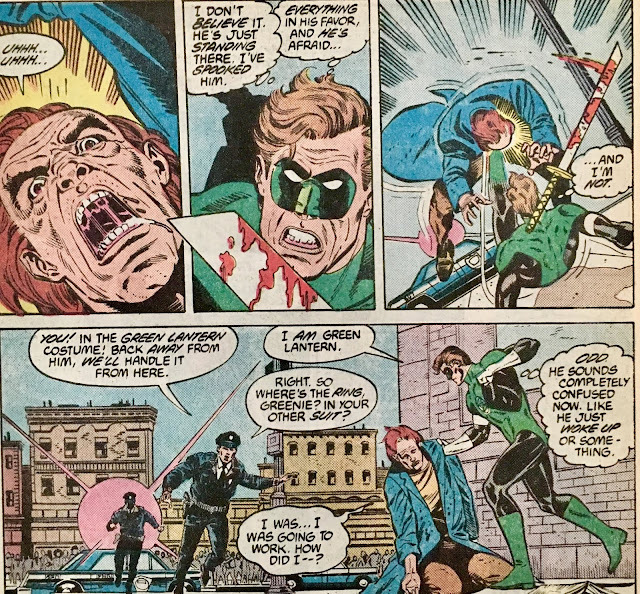 The Police come to collect the lunatic... leaving Hal to collect his ring, and take back to the skies. He probably could've just rode with the officers though, as they were headed to the same place. Hal checks in with a Lieutenant Rensaleer at the Chicago Police Department... who asks why Hal's once again wearing the ring. I mean, he took it off for like... what... a minute? Word travels fast in Chi-Town. Rensaleer takes Hal into the Records Room, so they can do a bit of research on the Samurai Guy. Turns out his name is Morris Levine, and his record (before today) is squeaky clean. Far as anyone can tell, he had no reason to flip out the way he did. We join Hal as he heads back to his hotel room, where he and his underage girlfriend chat a bit about his Oprah appearance. He's beginning to think that the women in that crowd were right! It's not possible to be completely fearless and still be... human. 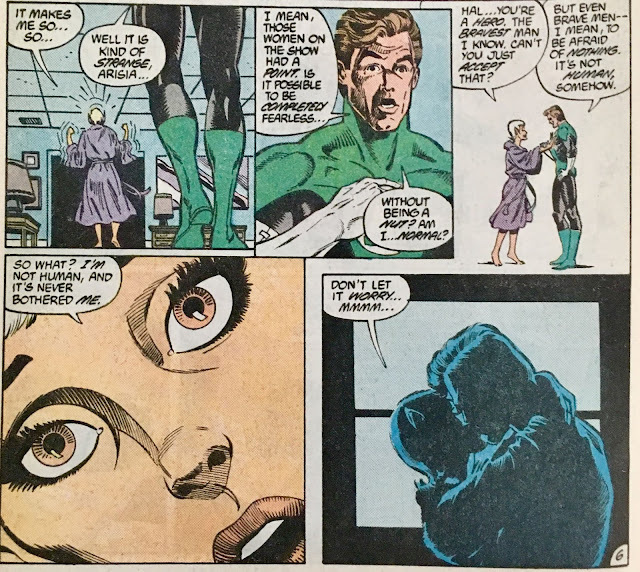 Arisia takes that to heart, considering she's A) not human... and B) someone who completely misses the point. 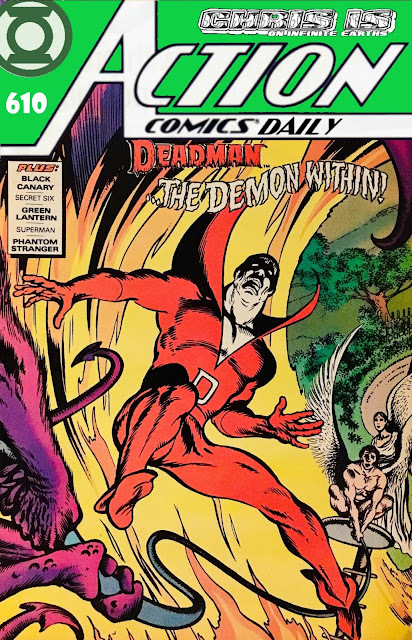 We wrap up with Hal ordering some room service before hopping in the shower. When the Room Service Attendant arrives... it looks like he's bringing something other than the "two Cokes" Hal had ordered. An okay chapter to set up the tail end of this arc. 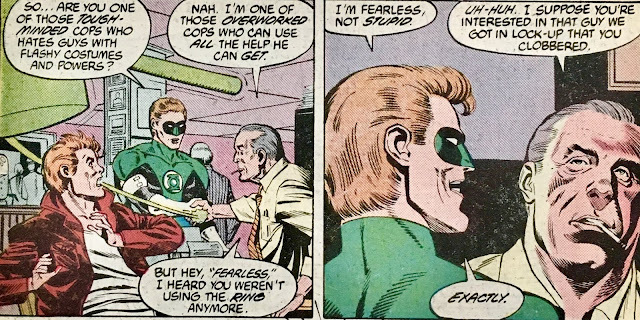 Hal's still questioning his fearlessness and humanity, which is all well and good... and is definitely the story here. But, since this is still a superhero comic book story... we're going to need some bad guys. Looks like "Mind Games" will fill that role nicely... though, we won't be meeting him for at least a couple of weeks. Really not all that much more to cover here... weirdness abounds in Chicago... and it's going to be up to Hal to get to the bottom of it. Wow, there were four "to's" in that sentence! We'll dig deeper into that weirdness next week. Tomorrow: The... wait... oh come on, not him!